From Bloomberg Auigust 3, 2011. “Employers in the U.S. announced the largest number of job cuts in July in 16 months, signaling a labor market that’s struggling to improve. Planned firings climbed 59 percent from July 2010 to 66,414, according to figures released today by Chicago-based Challenger, Gray & Christmas Inc. Job-cut announcements were led by the pharmaceutical industry, which included drugmaker Merck & Co.’s plans to eliminate as many as 13,000 jobs. The figures follow other data showing consumers retrenching, manufacturing cooling and confidence waning. Employers in July probably boosted payrolls at a pace that failed to reduce the jobless rate, according to a Bloomberg News survey before a report in two days. Compared with June, job-cut announcements increased 60 percent. Because the figures aren’t adjusted for seasonal effects, economists prefer to focus on year-over-year changes rather than monthly numbers. WASHINGTON, March 18 /PRNewswire-USNewswire/ — An unprecedented coalition of grassroots and “tea party” groups is launching the final push before a possible vote by the House. Coming together under the auspices of the American Grassroots Coalition, various events held by different groups will be coordinated, including a noon rally at the U.S. Capitol on Saturday, a candlelight vigil and “virtual vigil” leading up to the vote. “All of the groups have a mutual goal — to band together to communicate the frustration of the people and demand the termination of this health bill legislation,” said Jennifer Hulsey, Co-Founder of American Grassroots Coalition. The past two weeks has seen the “Take The Town Halls To Washington” initiative get nearly 1,000 people to DC to meet with approximately 30 Congressman. The event culminated in the rally at Taft Park near the Capitol, which was sponsored by Tea Party Express. Over 1,500 people assembled to rally against the health care bill and then meet with their representatives. While the Capitol Police diverted the stage and sound for the park rally, grass roots activists innovated and used a park bench and bull horn to get their message to the attendees! Grassroots activists everywhere have worked to inform themselves, notify their representatives of their objections and take action in the form of rallies, meetings and calls into those representatives. Individual groups have worked to stop the health care legislation while coordinating with each other to amplify their message and their efforts. For further information or to register and participate or assist others to come to Washington, DC, please check the above websites where details will be posted and updated regularly throughout the next 48 hours andhttp://www.americangrassrootscoalition.org/. Here are some of my favorite videos and testimony and experts on Obamacare, the Health Care Bill being forced on us. * Note two of the videos are no longer available here. What is the current attempt by Obama and liberal Democrats at health care reform all about? Appeasing their far left core support. More control over the American people to get votes. Payback to trial lawyers and other big supporters (refer to contribution table above). Achieving the goals of far left, socialist, communists who are controlling the party with the goal of redistribution of wealth..
Sally C. Pipes understands Canadian health care. As the former Assistant Director of the free-market Fraser Institute, she lived under Canada’s national health care system. Today Pipes is president of the Pacific Research Institute and author of the new book, The Top Ten Myths of American Health Care. She spoke at the Cato Institute July 15, 2009. “A radiation oncologist, Griffith cited the Democrats’ health care plans as a reason for his switch. He was one of 39 Democrats to vote against the bill in the House last month. in Elyria, Ohio, a government report indicated that unemployment was up in 43 States in December. Consistent with Obama’s past and personality, Obama’s speech is driven by Lies and Narcissism. Commentary is provided by Karl Rove, Sean Hannity and Citizen Wells. Fox News unemployment report, January 22, 2010. “WASHINGTON — Unemployment rates rose in 43 states last month, the government said Friday, painting a bleak picture of the job market and illustrating nationwide data released two weeks ago. The rise in joblessness was a sharp change from November, when 36 states said their unemployment rates fell. Four states — South Carolina, Delaware, Florida and North Carolina — reported record-high jobless rates in December. New Jersey’s rate, meanwhile, rose to a 33-year high of 10.1 percent while New York’s reached a 26-year high of 9 percent. Analysts said the report showed the economy is recovering at too weak a pace to generate consistent job creation. The MA Republican Party has a new video out accusing Martha Coakley of taking money from health insurance lobbyists. Was this a fair portrayal of Coakley’s ties to lobbyists and drug companies? From the Washington Examiner, January 8, 2010. “With Democrat Martha Coakley in trouble in the Massachusetts special election to fill Ted Kennedy’s seat, Democrats could lose vote No. 60 for President Obama’s health-care bill. 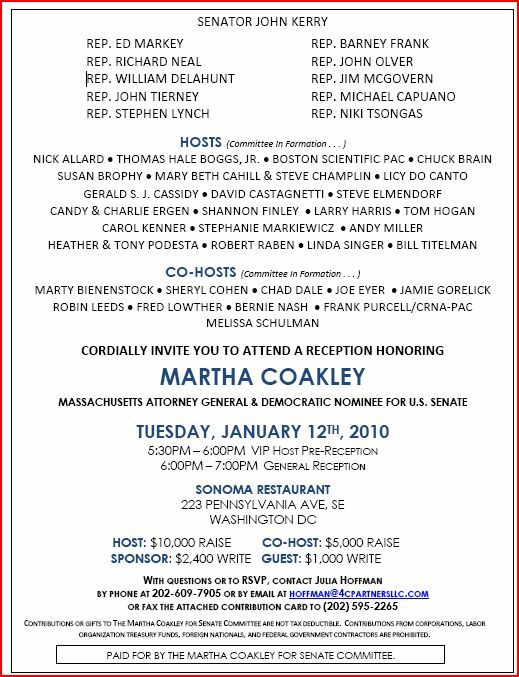 In response, an army of lobbyists for drug companies, health insurance companies, and hospitals has teamed up to throw a high-dollar Capitol Hill fundraiser for Coakley next Tuesday night. The invitation is here. “It won’t be the first time but Martha Coakley smeared Scott Brown tonight outside of her big Washington DC lobbyist fundraiser. Martha Coakley is a smear merchant. She already tried to tie Republican Scott Brown to Rush Limbaugh even though the two have never met. Now tonight Martha Coakley tried to tie Scott Brown to “extreme right groups” who she says are pouring money into Massachusetts. She says this despite the fact that Brown raised over $1.3 million, mostly in small donations, in an online money bomb yesterday. And, she had the gall to say this outside of her Washington DC lobbyist fundraiser where 22 big-time lobbyists from drug, health care and insurance companies met tonight to help bail her campaign out. Brian Maloney has more on Coakley’s big money fundraiser tonight. As if Martha Coakleys support from the corrupt establishment wasnt already clear enough, now comes word that a coalition of sleazebag industry lobbyists have teamed up with Bay State Democrats for an eleventh-hour bailout of her faltering campaign. From BNET, January 4, 2010. “The Mayo Clinic, which has been praised by President Obama as an exemplar for the healthcare industry, will no longer accept new Medicare patients at a primary-care clinic in Glendale, AZ, a Phoenix suburb. While this office serves only a small portion of Mayo’s 526,000 patients in Minnesota, Arizona, and Florida, the organization says that the Glendale clinic is part of a 2-year pilot that will determine whether Mayo continues taking care of Medicare patients at other facilities. Meanwhile, the 3,000 Medicare patients who see family doctors at the Glendale office will have to pay nearly $2,000 a year out of pocket if they want to stay with their physicians. Mayo is going in this direction because it lost $840 million last year on Medicare. Its Arizona hospital and four primary-care clinics lost $120 million. Nationwide, physicians earn about 20 percent less from Medicare than they do from private payers, but there’s no evidence that most are losing money on Medicare. In a Bloomberg article, Dr. Robert Berenson of the Urban Institute is quoted as saying that some primary-care physicians can afford to do without Medicare “because there is an unlimited demand for their services.” In areas where private health plans pay much more, Medicare looks like a poor payer, he adds. Thanks to my good friend Bill for the info.